These are the brand new Mister B Football Socks from the Mister B URBAN Collection. 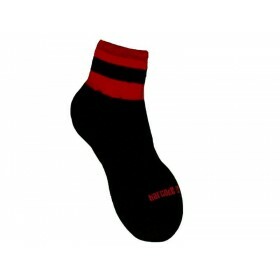 These URBAN Football Socks with the Mister B logo are high quality socks; made of mixed fibre, to ensure that the foot of the socks is mainly made of cotton for comfort. Because cotton is a 100% natural fibre, you won’t get sweaty or smelly feet wearing these. Understanding the needs of the party crowd, each pair of socks features one small inside woven pocket, so you can more securely carry something in it when going out.